Profit margins on imported goods are set to rise as GST would allow a larger share of input credit to importers compared with the current regulations. MUMBAI: The government is said to be devising a strategy to close off a loophole in the proposed goods and services tax (GST) that could hurt its Make in India initiative to turn the country into a manufacturing hub to generate jobs and boost economic growth. The government wants to ensure that importers’ margins are kept in check, people aware of this told ET. Senior officials, including financial services secretary Hasmukh Adhia, recently discussed the implications of GST on importers, they said. The government has also asked the GST empowered panel to apply its mind to the matter. The government will “find an amicable solution,” said one of those cited above. 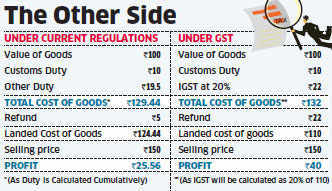 Currently, imports of most goods attract customs duty of 29.44 per cent at the standard rate. This includes basic customs duty (10 per cent), plus additional duty or countervailing duty (CVD) equal to excise duty at 12.5 per cent, plus 4 per cent special additional duty (SAD) and an education cess at 3 per cent. Under the GST regime, only basic customs duty will remain. Additional duty and SAD will be abolished and IGST (inter-state GST) is expected in their place. If the value of goods imported isRs 100, then currently the cost of import in the hands of the importer will be Rs 129.44. Under GST, the cost will be Rs 132. The government gives a refund of about 5 per cent to traders who sell the goods; they in turn credit that to the importer. A trader who resells the goods is eligible for refund of SAD of about 5 per cent. So the cost of goods comes down by about 5 per cent under the current regulations. Hence, currently, the net cost of import in the hands of the importer isRs 124.44. (i.e. Rs 129.44 minus Rs 5). If the same goods are imported after GST, the importer is eligible for refund or credit of full 22 per cent IGST, out of the total customs duty of 32 per cent. So the net cost of the goods imported in the hands of the importer post GST would be Rs 110 (i.e. Rs 132 minusRs 22). Assuming that the imported goods are resold by the trader at Rs 150, the margin for the importer under the current regulations isRs 25.56 whereas under the GST regime it will widen to Rs 40. “Under the current regime, by design or default, the additional duty or CVD part of the customs duty on import of goods into India, was acting as a tariff protection to Indian manufacturers,” said Menon. Experts said one way of protecting the Indian manufacturing sector would be to deny IGST input credit to importers. Which means the cost of goods stays at Rs 132 (from the above example) against Rs 110 under GST. Could such a move become a trade dispute matter? “I don’t think this could become a WTO issue, as such restriction of credit of CVD exists even today without any dispute at WTO forum. This is something the government must consider,” said Menon. Some industry experts said importers may pass on benefits to customers, maintaining their margins at current levels.